Rod MacKay as a player and as an investment advisor. A phenomenon as a high school athlete, Rod MacKay became a rare pitcher to play baseball professionally in his Vancouver hometown. At 6-foot-2 and a lean 170 pounds, the gangly hurler enjoyed a sensational record at King Edward High. He signed with the New York Giants organization, making his professional debut at age 18 with the Reno (Nev.) Silver Sox. He made a strong first impression, as the Nevada State Journal approvingly noted how he “had the batters at his mercy” in spring training. By 1953, he was pitching for the Vancouver Capilanos of the Western International League, who used the versatile thrower as both starter and reliever. On July 6, 1954, he started the second game of a doubleheader against the Senators at Salem, Ore. The first game had been started and won by Arnie Hallgren, another King Edward product to have made the Capilanos’ roster. It is believed to be the only time two Vancouver-born pitchers started both games of a doubleheader for a professional team. Mr. MacKay had a record of five wins and five losses in two campaigns with the Capilanos. He also pitched for the Erie (Pa.) Sailors, the Sunbury (Pa.) Giants, the Knoxville (Tenn.) Smokies, the Brandon (Man.) Greys, and the Idaho Falls Russets. He once won a game for the Russets in which he enjoyed a surfeit of run support. He limited Boise to a run on six hits, while teammates scored an impressive 23 runs. Mr. MacKay was an investment advisor for 37 years with Pemberton Securities. He delivered daily business briefings in the 1970s on New Westminster-based radio station CKNW. His father-in-law was Johnny Nestman, a popular industrial league player in Vancouver who was named to the B.C. Baseball Hall of Fame. 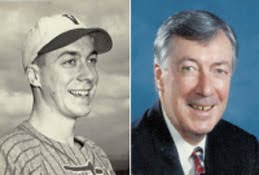 A longtime coach for youth baseball, Mr. MacKay helped launch the career of a namesake son, who pitched in relief for Canada at the 1977 world amateur baseball championships in Managua, Nicaragua. Roderick Archibald MacKay was born on Nov. 20, 1930, at Vancouver. He died of complications from Alzheimer’s disease on Aug. 26 at Mount Saint Joseph Hospital in Vancouver. He was 78. He leaves Reneth (nee Nestman), known as Rene, his wife of 58 years; a daughter; two sons; six grandchildren; and, a sister.